OperaDDS is a complete communication system that is ideal for those looking to improve communication with patients, as well as communication between staff members. The system can be a powerful tool that helps streamline your dental practice, and helps you provide an exceptional patient experience. 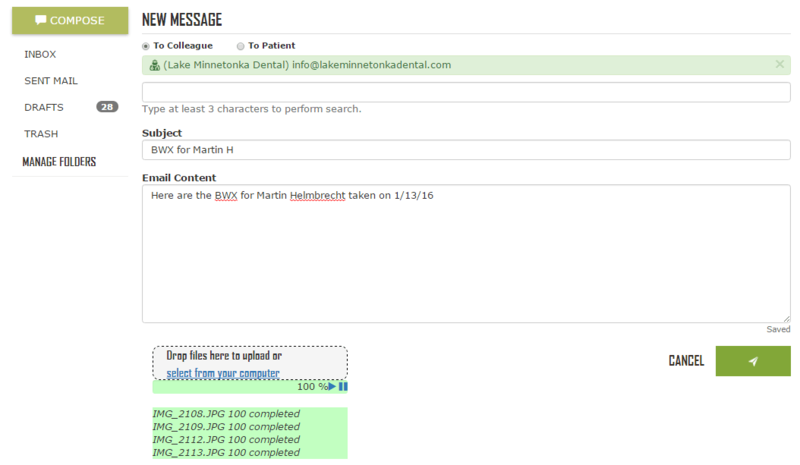 Dr. Bryan Laskin, a practicing dentist and owner of Lake Minnetonka Dental, created OperaDDS after he realized the need for an intra-office dental communication system that was easily accessible, yet also HIPAA-compliant. As a member of the Minnesota Department of Health’s ePrivacy and Security Workgroup, Dr. Laskin thoroughly understands HIPAA compliance, which explains why the OperaDDS team has gone to great lengths to make sure that their product is compliant. There are currently thousands of dental practices using OperaDDS, and a team of 15 working to develop the product. How is OperaDDS Different From Other Patient Communication Systems? How Does Intra-Office Communication Software Benefit Your Practice? Is OperaDDS Right for You? $299/month package includes all of the above, as well as automated patient communications. You may be familiar with other patient communication systems, like Lighthouse 360, SolutionReach, and RevenueWell, which primarily focus on improving patient recall. While OperaDDS includes patient recall capabilities, it also offers an additional capability that distinguishes it from other patient communication systems: its intra-office communication module, Pager, enables staff members within the same practice to communicate with each other in a HIPAA-compliant manner. With a customizable handoff checklist, staff are able to relay information to the doctor prior to coming into the operatory. This feature increases case acceptance by empowering staff to preempt treatment plans for the doctor. Some major patient communication systems help solicit reviews from patients in order to build a stronger web presence. Though this is a nice perk (and something that OperaDDS is developing), it's worth keeping in mind that these solicited reviews are usually added to a third-party review site (e.g Demandforce reviews will be posted on a local.demandforce.com page, as discussed in our review of Demandforce), as opposed to more trusted sites like Google or Yelp. So, even if you get a lot of reviews from one of these systems, you still need to work to gain reviews on Google and Yelp, which are more trusted sites and add more value to your web presence. If you are currently using a patient communication system that you're satisfied with, you could certainly continue to use it while leveraging OperaDDS's intra-office communication capabilities. However, roughly 80% of OperaDDS's customers use the full system, including the Recare module. Most of OperaDDS's clients haven't used intra-office communication systems before -- they've primarily communicated in-person or with sticky notes. While this can get the job done, there are many benefits to streamlining this process with software. Most importantly, streamlining all of the practice's communication in one system can provide a better patient experience in the office. It's particularly impressive when a dentist is able to walk into an appointment knowing exactly what the patient's primary concerns are, and what the patient's status is, rather than having to be informed of the status during the appointment. If the dentist is seeing one patient, they can also receive important notifications about other patients behind the scenes without being interrupted. This enables dentists and hygienists to spend more quality, focused time with the patient. Streamlining in-office communication with a tool like OperaDDS can also help increase treatment plan acceptance rate, by helping hygienists and dentists get on the same page about a patient's status. For example, the hygienist can mention that something is worth getting looked at, and later in the appointment, the doctor can come in and validate the hygienist's hypothesis. This calibration can lead to a higher case acceptance rate -- if both the hygienist and the dentist verify that a certain treatment is worth pursuing, this can have a very powerful effect on the patient. OperaDDS reports that many clients are also often able to increase the amount of same-day dentistry that's done as a result of streamlining their communication. OperaDDS is composed of 3 major modules; each of which is designed to handle a different aspect of communication. We'll briefly walk through these modules and explain how they can benefit your practice. The Recare module is OperaDDS's patient recall system (analogous to Lighthouse 360 and Demandforce). It enables users to send two-way text messages, emails, and postcards to patients. All of these messages are customizable, so that you can determine which messages get sent to whom, and what content goes into each message. In addition to the typical text/email/postcard reminders, Recare builds upon OperaDDS’s HIPAA compliance focus by including CareText. CareText allows offices to securely send two-way text messages with patients and colleagues. A “chat now” button is placed on your website for people to chat with anyone in your office, either through OperaDDS’ interface, or by text message alerts. Also, OperaDDS’s paperless, secure forms will offer unique capabilities when they are available in April 2017. The Recare module integrates with Dentrix, Eaglesoft, and Open Dental. If you use another system that's not currently supported, you won't be able to use the Recare module, but you can take advantage of any of the other modules that help with increasing production and HIPAA compliance. Pager is effectively an instant messaging system that enables staff members to securely communicate important information in real time. As we mentioned, being able to communicate about patients behind the scenes in real time can greatly improve the patient experience. In the following example, the front office uses Pager to send information about a patient to the dentist, prior to the dentist seeing the patient. This small note contains a checklist of all of the important information that the doctor needs to know. A note like this offers a lot of subtle benefits to the patient's experience. For one, prior to even speaking with the patient, the doctor will already know what the patient's primary complaints are, and if there are any issues that need to be addressed. In this case, Sally appears to have concerns about crowns being expensive through her insurance. Because the doctor was given advance notice of this concern, they can look up the relevant insurance information beforehand, and assuage some of these fears by letting her know the exact price of crowns. By giving staff members a convenient way to relay important messages in real time, dentists are given enough notice to be able to address their patients' concerns more quickly and thoroughly. Furthermore, if Sally were to agree to get crowns, it's possible that Sally could receive treatment immediately instead of having to make a separate appointment (assuming the staff were available). This is just one example of how OperaDDS could increase the amount of same-day dentistry your practice provides. As with any other traditional instant messaging system, you can create "teams" to send messages to multiple people at once. Since the system enables you to receive these messages in the background while you're busy seeing other patients, the messages won't interrupt your workflow. You can also receive these messages from anywhere -- even outside of the office -- since the system is purely web-based. Chorus is OperaDDS's secure e-mail system. Whereas Pager is primarily focused on communication within the office, Chorus is designed for external communication. This can consist of patient communications or emails/messages to partners, such as labs and specialists. In order to use Chorus to send secure messages to other dental offices, the recipient must sign up for a free OperaDDS account to fulfill HIPAA requirements. You can also attach images to any e-mail, and store images in LockBox, which is OperaDDS's version of DropBox. When you send messages through Chorus, you can receive a confirmation whenever one of your messages has been opened. If a message hasn't been opened yet, you have the option to delete it if, for example, you realized that you included the wrong information. This is a nice feature that helps give users more opportunities to remain compliant. Chorus plays a pivotal role in increasing case acceptance rate since it helps you keep track of cases, send them to specialists and/or labs, and keep track of each case's status. The system makes it easy to identify cases that are in progress but require follow-up, so that you can make sure cases don't slip through the cracks. Intra-office dental practice communication is often an overlooked aspect of running a successful practice. By using software to streamline all of your communications, you can increase patient recall and patient satisfaction. Though there are many options when it comes to patient communication systems, OperaDDS is a HIPAA-compliant web-based system that stands out from the crowd because it also offers intra-office communications. 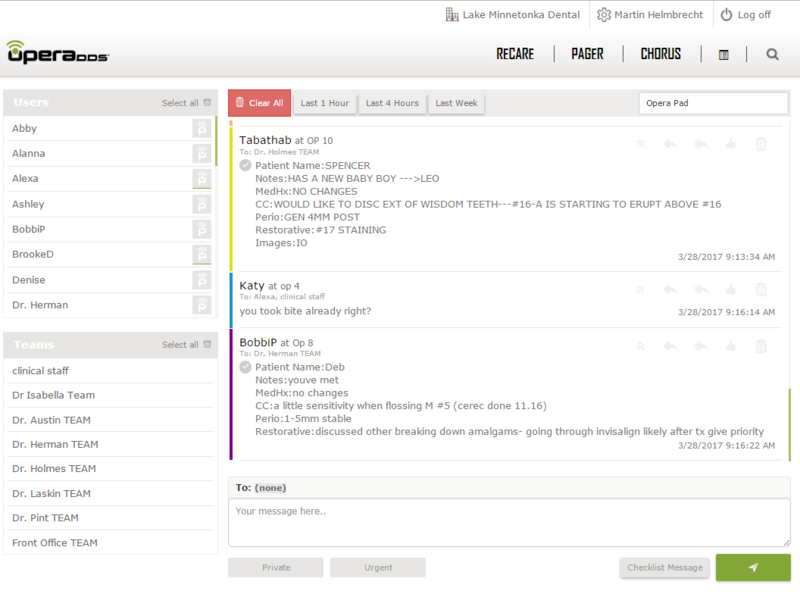 If you're looking to streamline communication with your staff and patients, then OperaDDS is a top option to consider. To learn more about OperaDDS, you can visit their site here. You can also read our interview with Dr. Grace Chung, owner of Smile Shop Dental, to learn why she decided to use OperaDDS to streamline her practice's communications, and how she was surprised by the benefits of intra-office communication software, even in a smaller office.